The USPS has issued the 41st stamp in the Black Heritage series honoring the achievements of legendary performer and civil rights activist Lena Horne (1917–2010). The stamp art features a photograph taken by Christian Steiner in the 1980s. Kristen Monthei colorized the black-and-white photograph. Remembered as one of America‘s great interpreters of popular songs, Horne was also a trailblazer in Hollywood for women of color. She used her personal elegance, charisma, and fame to become an important spokesperson for civil rights. The stamp art features a photograph of Lena Horne taken by Christian Steiner in the 1980s. Kristen Monthei colorized the original black-and-white photo, adding a background reminiscent of Horne’s Stormy Weather album, with a few clouds to add texture and subtly make the album reference. 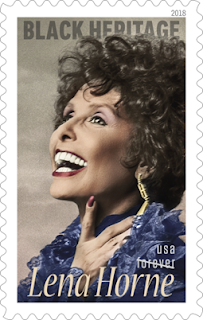 “Lena Horne” is written along the bottom of the stamp, with “Black Heritage,” the stamp series title, at the top. “USA” and “Forever” appear on the lower right-hand side above Horne’s name. Art director Ethel Kessler designed the stamp.